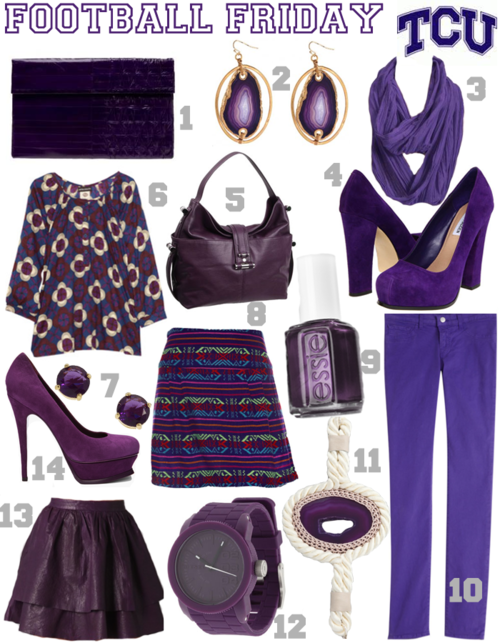 One of the more fun colors to wear to a football game, here’s a collage of purple pieces for my Horned Frog friends! Hope all of you have a great Labor Day Weekend – today I’m driving back to Austin and then heading down to College Station for the SMU vs. A&M Game on Sunday! Should be a rowdy time filled with good friends, beer and good old college football! Cheers! PS: Check out the rest of Kenny on ShopBop for a variety of other brightly hued, bold skirts like this one!